How is Word Stress Represented? How to Refer to Syllables? Word Stress Placement – Interactive! Home About Stress in English What is Word Stress? 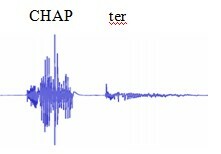 This graphs represents the intensity of the word chapter, illustrating the difference between the stressed and unstressed syllable. Check how much you remember with this quick exercise. This website is currently under construction. Feel free to provide feedback by email using the the address below.